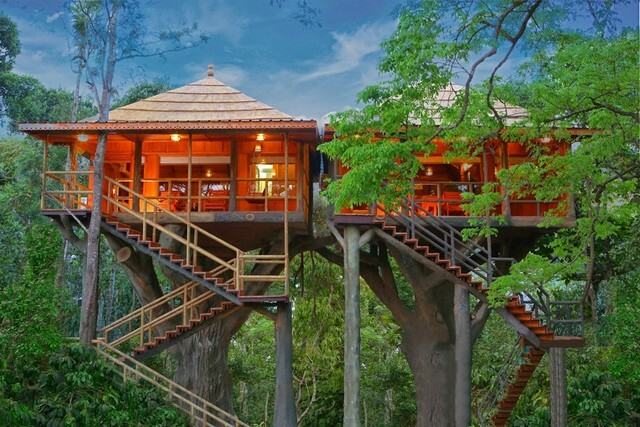 When you talk about tree houses, a feeling of uncomfortable stay but the tree houses in Kerala are all equipped with all necessary amenities and has electricity. They are usually situated in the midst of forests and this makes the stay extremely interesting. At night there is peace in the air with an occasional chirp from a friendly cricket. 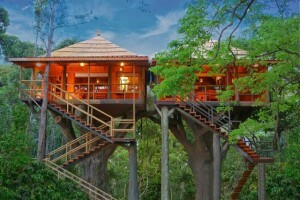 I would say that staying in a tree house is mandatory if you are visiting places like Wayanad, Munnar or Thekkady because you visit these places with the sole aim of being pampered by nature and nothing brings you closer to nature than this: tree house living in the midst of a very green and spectacular forest. Floating cottages are a concept I did not know a few months back. But once I heard about them I became completely obsessed with staying in one. Imagine living on a cottage which is on water! Floating cottages are made of hollow concrete base and wooden walls. Some of them have thatched roofs. So basically they look like actual houses on water. And instead of a driving home in a car you row home in a boat. Isn’t that fun? 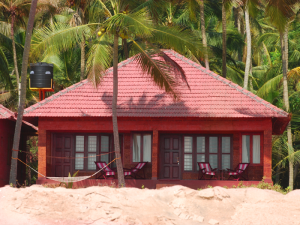 You can find such floating cottage stays in Poovar, Thiruvananthapuram, Alleppey and even in Ashtamudi Lake, Kollam. So if your tour includes any of these places drop the hotel room and float on water for the night. Now, if living on a cottage in the lake isn’t appealing enough for you, there is always the option of staying in a house boat. House boats, unlike floating cottages, could be steered and all day you will be on a cruise. Then at night, they are usually anchored in the middle of the water body. This way, you are nowhere near the land and there is complete calm and quiet around you. These house boats have all modern amenities in them and some are even as luxurious as a 5 star hotel. They also serve indigenous food on board. So all you have to do is sit back and enjoy your vacation in the middle of the lake or backwater. You can book a house boat for your stay at Alleppy, Kumarakom, Bekal, Ashtamudi etc. Check out some of them online and book your stay in advance to prevent any last minute confusions. 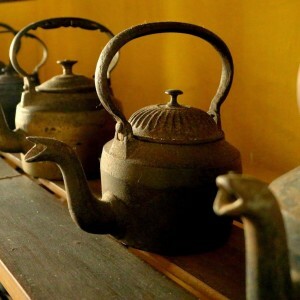 Home stays are a perfect way to learn about the culture and lifestyle of a place you are visiting. They may sometimes be a little over the budget but when you stay at local homes, you get to stay in homes and blend in with the local crowds. 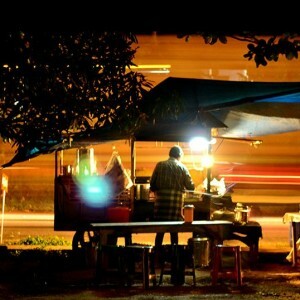 These days home stays are becoming commercial but try to find authentic places, you can have a lot of fun. The families running these stays are usually very friendly and helpful. 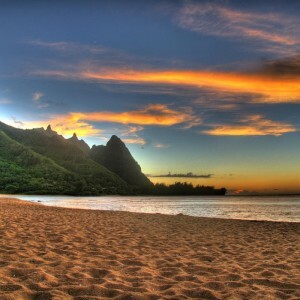 They will even help you see these tourist places like an insider. 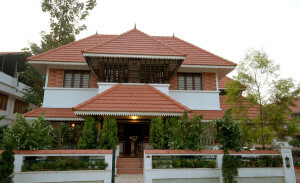 There are some really good home stays functioning in most tourist destinations especially in Wayanad, Munnar, Kochi, Kumarakom etc. Don’t forget to consider the home stays before getting a hotel room. Kerala usually does not have many camping options because of the fact that people visit the state for a relaxed, laid back holiday and camping needn’t always guarantee that. However, with more adventure lovers coming to visit, the state has now opened up to the idea of campers and has allotted areas for camps to be set up. You can see camping options in Gavi, Munnar, Ponmudi, Vythiri etc. Make sure you choose a safe area to camp especially if you are closer to a water body or a forest. Growing up I always thought beach houses could be afforded only by the rich. Then my parents took me to a beach house in Cherai and I absolutely fell in love with the whole experience. Waking up and running to the beach first thing in the morning, staying in the water until someone came and pulled me out of it, flying kites, making sand castles and then falling asleep in the hammocks are all much more fun in your own private beach. Make sure you book a beach house if you are going in a group. It is definitely worth it! 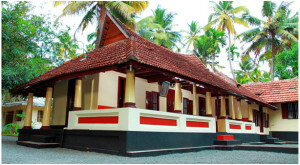 Nalukettu is the traditional style of houses in Kerala. These are the houses with open courtyards in the middle and in earlier times huge joint families lived in these bungalows. The houses used to have thatched roofs and even on extreme summer days the temperature inside these houses is low. During monsoons, the rain comes in through the open courtyard and it is perfect to curl up somewhere in the hall with a coffee and a book. 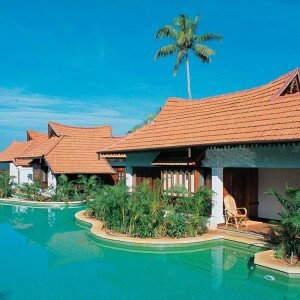 Now, however, the indigenous Nalukettu houses are pretty much gone but some resorts try to copy the designs. 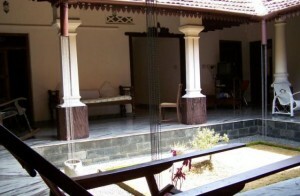 Stay in a Nalukettu structured resort or hotel if you can. It could be expensive, but the beauty of the architecture is sure to captivate you.